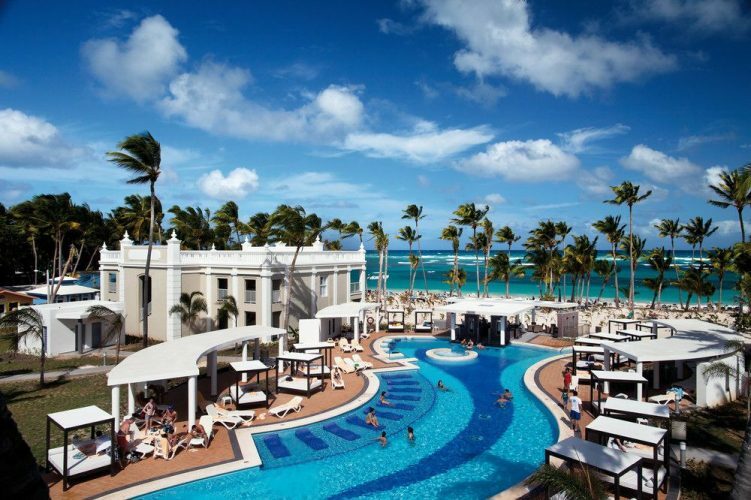 ‎The Hotel Riu Palace Bavaro (24h All Inclusive) is a new RIU hotel in a beachfront location in Arena Gorda in Punta Cana, Dominican Republic. It is the perfect place for families, couples or friends to enjoy high quality RIU service, the comfort you can expect of a Palace and the beaches of this marvelous destination in the Caribbean. There is no better way to relax than by enjoying the facilities that this complex has to offer its guests. It includes three fresh water swimming pools, two Jacuzzis, a solarium terrace, gym, steam bath, sauna and a spa with a range of different beauty treatments and massages. In the Dominican Republic you can find all kinds of international cuisine, but if you want to make the most of your stay in this marvelous destination and sample Dominican delights, rich in flavor and above all in color, you can enjoy a wide variety as Dominican cuisine consists mainly of fruits and vegetables. The Riu Palace Bávaro includes several restaurants such as the buffet restaurant and various themed restaurants where you’ll find endless menus and recipes that are prepared every day in the complex. The Palace is within a Riu Resorts complex shared with the Riu Palace Punta Cana, Riu Palace Macao, ClubHotel Bambu, and Riu Naiboa. Here, thanks to the acclaimed All Inclusive system you can have a fun all day long as a family, couple or with friends with the entertainers of the entertainment program or doing the various activities and sports. At the hotel you will have the opportunity to enjoy tennis, table tennis, swimming in the pool, volleyball, windsurfing, sailing, kayaking, snorkeling, body boarding, horse riding and other water activities. Near the hotel, golf lovers will find a course with several routes where they can practice their swing. At night there are shows and live music as well as the “Pacha” club and the “El Millón” casino. Prices are per person and includes: Hotel Accommodations, Roundtrip Airport Transfers, Gratuity & Taxes. Airfare is NOT included. Deposit Due Date; General Conditions: To reserve your space a deposit of $50.00 per person is due by JUNE 15, 2018 ( $100 for single occupancy). After this date the deposit due is $100 per person. After the initial deposit is paid the suggested payment plan is as follows: $100 per person due by AUGUST 17, 2018; $100 per person due by NOVEMBER 16, 2018; $200 per person due by MARCH 15, 2019; with the final payment due on or prior to JUNE 10, 2019. Note: full payment can be made anytime prior to final due date and a payment plan that works for you may be arranged. *If adding air, the required deposit is $200 per person, however, this depends on the airlines. Payment in the form of creditcard (authorization form attached), check, cashiers check, or money order made out to WorldView Vacations can be mailed to PO Box 88464, Los Angeles, CA 90009. Cancellation: There is a cancellation fee of $50 per person this is in addition to charges and/or fees imposed by hotel. MAKE YOUR DEPOSITS TODAY, PRICES ARE SUBJECT TO INCREASE. To protect your vacation investment you may purchase cancel for any reason trip insurance which is $99.99 for hotel and transfers; and $119.99 for air, transfers, and hotel.